from the nato's: amazon student. bam. i wish i was still in college. not to learn, but to get this deal. 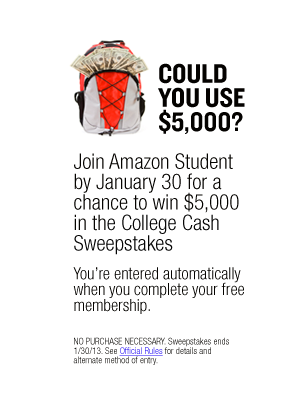 because you can join amazon student right now and get free prime shipping for 6 months. that means everything delivered to your door in 2 days. what do college students buy from amazon? i'm not sure, because they don't sell beer. or do they? what's better than beer is that when you send your amazon student referral link to your college buddies, you get $10 for every person that signs up. $10 for a college student is like $1000 in dog years. that makes no sense. but you get my point. if i was a student, i'd be all over this. plus you get entered into a little sweepstakes when you sign up.